First is the “set-it-and-forget-it” management style. They check in on the ads once a month (or so), but for the most part do not make any edits. In other words, they are not actively managing and optimizing the campaign. Hey, I get it. Who has time to make all the necessary edits when you have a business to run? Second is the “bidder” management style. They actively check the campaigns (daily or weekly) and edit bids, usually to hit a predetermined cost per click. This is better than ignoring the campaign, but it’s missing the bigger picture when it comes to optimizing ad campaigns for return on investment (ROI). It’s the equivalent to making stock investment decisions based solely on the cost per shares. As you can probably imagine, neither style above leads to optimal ad performance. Even a campaign that is set up perfectly will slowly, or in many cases quickly, degrade to thinner and thinner profit margins if it’s not managed properly. There are just too many outside factors, like new advertisers entering the marketplace, changes in competitor bids, and even AdWords updates that will affect your performance and require changes in your account. Where should you focus your limited time and energy to ensure your ads are as profitable as they can be? In this article, I’ll walk through 3 critical areas to review in your Google AdWords campaigns. And the good news is that you can review and improve these areas of your AdWords campaigns in as little as 15 minutes per day. This may come as a surprise to you, but unless you’re only using Exact match keywords, then your ads are showing for more keywords than you have listed in your account. To prove this, take a look at the Keyword Details report in your AdWords account and you’ll see every single search term that triggered your ads. There are two actions to take based on this data. First, if you find more keywords in this list that are relevant and are converting into leads and sales (based on conversion tracking), then add these phrases as additional keyword targets. By targeting these phrases directly, you’ll be able to tailor your ads and landing pages more precisely to these searchers. Second, if you find keywords in this list that are irrelevant or are simply not converting, then you can add these as negative keywords in your account. A negative keyword will prevent your ads from showing on those searches in the future, which will ensure you no longer waste your ad budget on those searches. Those two actions alone can significantly improve ROI in any campaign and it does not require any fancy tools or knowledge of statistical significance. Assuming you’re targeting relevant keywords, then your ad copy is the single most important element of your campaign that will determine success or failure. Because your ads play a key role in determining your ad position, your cost per click, and whether or not your prospect converts into a customer. Ads that get a high click through rate (CTR) compared to the competitors will get better ad position and lower cost per click. So do not ignore your ad copy! This is an area in your campaign that needs to be continually optimized by testing new ads and offers. Always test a couple different variations of your ad copy to see which one gets a higher CTR. Simple edits like flipping the description lines can have a big impact on CTR, which again, could lead to better ad position and lower costs. Finally, the third area to review is your landing page and sales path. It’s possible your AdWords campaign is generating quality traffic but you’re not driving sales because your website or your sales process is not set up properly. The metric to keep a close eye on here is your conversion rate. If you have an e-commerce website, then a conversion is an online sale. If you sell products or services off of your website, then a conversion could be a phone call, an online contact form, or a demo request. Whatever your goal is, you need to track it and make sure you have a way to measure your conversion rate. Consider this fact: If you doubled your conversion rate without changing anything else in your AdWords campaign, then your cost per sale would instantly be cut in half! That would dramatically change your ROI from AdWords. So do not ignore your landing page and sales path! It’s absolutely critical to the success of your campaign to continually optimize your conversion rates. Test your offer, your page layout, design, and the copy to see what works best for your market. 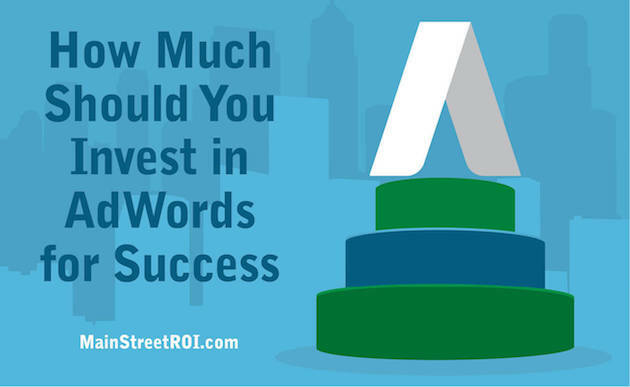 Want More AdWords Management Help? Next week I’m presenting a live training called How to Profit with Google AdWords In Just 15 Minutes Per Day!